Stormy grew up in the area and was involved with Southeastern through his lengthy career with the Hammond Fire Department, where he retired as assistant chief three years ago. One of his greatest achievements, he said, was helping to get the Southeastern firetruck painted in its signature green and gold design. Denise came to work at Southeastern in 1985 and was generally involved in the workings of campus, retiring six years ago from the nursing department. But their deep love of the university was born at a press conference in Strawberry Stadium when the football program was reinstated in May of 2002. 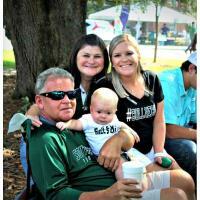 The Lees, their children and seven other families have held the same tailgate spot in Friendship Circle since 2009, providing a smorgasbord of food and entertaining anyone who wants to stop by – including the out-of-town families of the football players, Lionettes and the cheerleaders. This year an Ohio family whose older son played for Southeastern and whose younger son now plays for Bethune-Cookman, asked to join the Loyal Lions at the tailgate for the Southeastern vs. Bethune-Cookman game. The Lees have raised their children, Jacob Lee and Rainey Lee Mikel, to love Southeastern, and are proud to tell you their daughter and daughter-in-law, Lauren Lee, are both Southeastern graduates. Jacob has followed his father’s footsteps in joining the Hammond Fire Department. Their son-in-law, Travis Mikel, is the assistant football coach for Southeastern, and he and Rainey are raising their son Cam to be a little Lion as well. Want to share your Southeastern story? Email Greater Hammond Chamber President and CEO Melissa Bordelon at melissa.bordelon@hammondchamber.org.